A solid thesis statement is critical to the success of any essay, but I often find my students disengaged while I try and teach them the fundamentals. Out of desperation, I tried this activity, and it was a resounding success. I saw improvement immediately on the practice thesis statements used for the activity. That improvement then translated into their next essays. Yes, there was a bribe involved, but whatever works, right? 2. Facilitate a short class discussion on the topic to get them thinking about the pros and cons. For the AutoTune example, we talk about whether an artist who uses AutoTune in a live concert or on a recording is deceiving the audience. We talk about the common use, the ethics, and whether the audience should be aware of its use. 3. 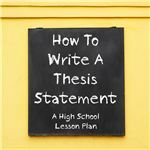 Ask them to write a thesis statement about the topic (as if they were going to use it for an essay). Tell them not to write their names on the paper. 4. Collect all the papers, shuffle them, and redistribute. Ask students to carefully read the thesis on the paper they have. 5. Now ask all the students to stand up. 6. One by one, go through the points of a good thesis statement. For example, say, "Does it contain a clear opinion?" 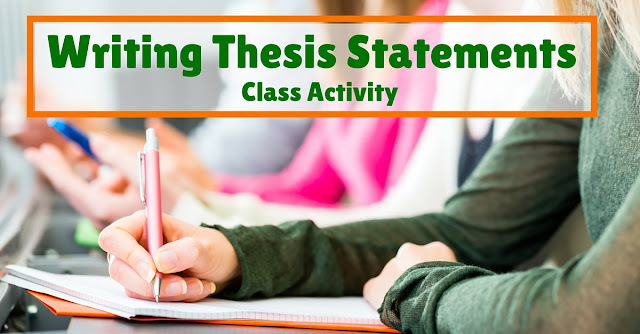 Have the students consider the thesis and sit down if it does not meet the criteria. 7. When you have only a few students left standing (or have gone through all the criteria), have the class vote on the best thesis still remaining. I've done this for several quarters now, and the students always show improvement, I think because they are so engaged in the process, whether in writing their own thesis or evaluating others' thesis statement. If you need a lesson for writing a thesis statements, here's the one I use. It's a Power Point presentation, along with handouts and worksheets.